I love horses! Therefore, I love all games that do NOT show any negative things about horses. This game is one of those games. Make your dreams come to life by riding in Rider's Paradise! Play the role of Natalie, a new student at Riders Paradise. Learn to ride and care for horses, live a story line about friendship, love for horses, wrong choices, sacrifice and responsibility. Take part in equestrian events such as dressage, jumping and cross country competitions. Do the baby horses you breed ever grow up? After you beat the game can you still show and take care of your horses? HEY ROZTRIP u play Petz Horsez 2 me too but what do you do after breeding a horse what is the mission? SELL IT NOW SO PEOPLE CAN PLAY IT!!!!!!!!!!!!!!!!!!!!!!!!!!! it sounds like a great game i sooooo want it! i got this game for Christmas and I luv it so much thanx for the info. i wish you could name your horse and have a headset to be natalie's voice that would be awesome!!!!!!!!!!!!!!!!!!!!!!! i used to have 2 horses and they had a baby. It's good but it ends too quickly. the characters are from the Saddle Club. it's alright, though you don't get to name your horse but his name is only mentioned one, toby. this game is a short game and the foal doesn't even grow up. if u have a ps2 u should get pet horses 2 it's long and best for horse lovers like me. Ok so this game is really fun but I beat it in about 3 hours. There is not a great plot line but it is still fun to ride, customize and dress-up your horse. It is pretty good but if you are looking for something that will take you a long time to beat, this isn't the game for you ;) still good though. well I wish i had it but from the other comments it sounds fun but short and not that fun. This game was very fun, but it was to short lived. I'm a true gamer and if I came bet a game in less then 5 hours, it's too short. On the other hand it was a good game to play. this game is awesome! this girl asked what do u do with this and u take it to max. This game looks awesome, I must get it!!!!!!!!! I thought this game was fun the first time I played it, but after you beat it there isn't anything interesting to do. I have 2 get this game, it sounds fun. 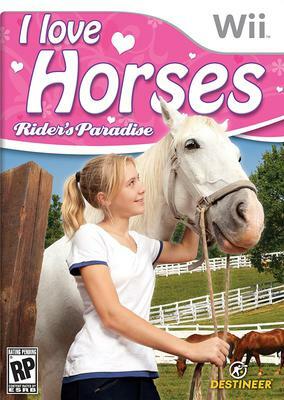 This was my first EVER wii horse game and it was really fun! i went on adventures all the time! I don't get why it's called I Love Horses when it has the Saddle club in it. Otherwise it's SOOOO fun. do you get to breed horses, do you have any challenges, is it like petz horsez 2????? I must buy this wonderful game! i want this game sooooo bad!! I love horses and horse games but what i really want is a real horse but horse games are cool too. In this game u have to take pic of a pocher... what do u do with this pic?